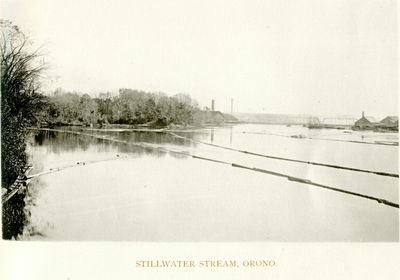 "Orono, Maine, Stillwater Stream "
An image scanned from a black and white print labeled "Stillwater Stream, Orono." Image appears to have been taken in the vicinity of Webster Park or along North Main, with mills visible on both sides of the river and the railroad bridge in the background. Circa 1895.